Hello and thank you for the opportunity to serve. There is no greater blessing than to use the gifts you've been given to directly benefit others! If you love what you do you will never work a day in your life! Be certain, making music is unlike anything else you've done. At the same time, making music will strengthen everything else you WILL do! Whether you choose me to help to you along the way or another teacher, please be sure to get a teacher that is patient, experienced and disciplined. Your first year of music lessons will either create a strong foundation or collapse under the partially built structure. Give the teacher a chance to make their point. Don't be too quick to judge based on the inexperience of the student. The fundamental lessons must be repeated until learned. Whatever you do, get a teacher. Do not waste time believing you can 'self teach'. Your technique needs to be monitored by someone who knows music. It's my belief that music fundamentals are critical and we will create a solid musical foundation by learning the language, understanding the critical issues of timing, rhythm, reading and learning how to LEARN! I enjoy working with all ages but specialize in children and adults that act like children! Stay a child! Learn something new. If you don't see an availability you would like, please feel free to contact me via the TakeLessons site and ask questions! Taught Sunday school, was music leader for Vacation Bible school and Instructor for outdoor Camp GOTCHA. Full service music store and teaching studio. Teaching studio carried as many as 200 students a week. Taught classroom and laboratory electronics. Go Navy! My sweet student, Elise playing Fire Fly. Excellent teacher. Teaches very well and is very understandable and explains the lesson plan very well. Such a wonderful experience. My son Gabriel was so excited and loved his lesson. He came home and started practicing right away. Karen was so patient and an excellent teacher. We would like to thank Karen for patiently teaching our son Federico. It was a pity we had to come back to Italy and w're missing such a positive inspiration for our son. Thank you again Karen for your professionalism and love in teaching our young son. My daughter has loved having Karen as her teacher. She is kind and patient. My daughter has made tremendous strides and is loving the violin! I even catch her practicing without being asked! Karen is so patient, yet challenging! She has a great personality, and she is super encouraging! We have just had one lesson so far, but my five year old son has been voluntarily and joyfully practicing everyday. That's a miracle in my opinion! They only thing I have ever played was the radio. Karen is gentle, understanding, and can play anything really well. She helped tune my guitar, showed me how to play a little tune using several strings, and removed my apprehension of learning. I am rather impressed for a 73 year old man. I guess you can teach an old man new tricks. Very comfortable, knowledgeable, zeroed in on what I wanted to learn. Karen challenges me to reach but instills confidence that I can do this! Ms. Karen has been very patient with our first time piano player. My son practica without being asked and looks forward to his lessons with Ms. Karen. My daughter had her first lesson and loved it! We will be coming back. My son was learning Piano lessons from Mrs. Karen. It was really a great experience. He loved learning from her. She went above whatever is there in the book and taught him extraordinarily. Really appreciate her extra care in teaching her students!!! Thank You Karen for having you as my Son's Piano teacher. Karen is wonderful with my 5 y.o. son. She is an excellent instructor and you can tell she loves what she does. Thank you, Karen, for starting my son on what I am sure will be a lifeline love of music. Karen is great teacher for the very beginner and the advanced musician! I can't put into words how great Karen is! She is patient, loving, and a great instructor! You will love her! Karen is really a great teacher. Could tell from just this first lesson, can't wait until next time. Five Stars - Karen is very nice, personable, loves teaching. She's an excellent Instructor. Karen is thorough. You will find out immediately that she will find your weaknesses and work on those. She is a pro - she knows what she is doing and she knows what her students need. She listens to what her students want to accomplish and then she will add to her responses extra instructions that will focus on big picture success. She really understands the difference between playing alone and playing with a group. She knows exactly how every band member will respond to what you are playing. We love her!! She is very good with Bryson and gives good instructions. We also like the home work that Karen gives. 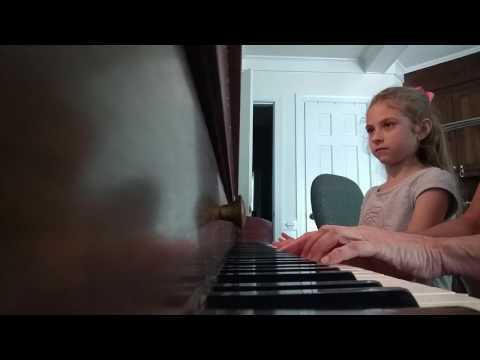 We highly recommend her to anyone learning piano.